Once upon a time, Starbucks was revolutionary, but in true New York fashion, the coffeehouse has modernized once again into the independent and artisanal third-wave Fête Coffee. This beautiful little café in the Gramercy Park area is the perfect relaxing hangout, whether you want to bring your laptop and get some work done using their free Wi-Fi or if you want to spend an hour sipping a cappuccino on the couch in their welcoming lounge area. If dining in, they even offer a collection of designer mugs for your use, ranging from cute to gimmicky and created by artists and architects. Once you’ve picked yourself a mug, bring it up to the counter and order your drink. Unlike chain coffeehouses, Fête takes the time and utmost care to make each cup of coffee and espresso perfectly and with great attention to detail. 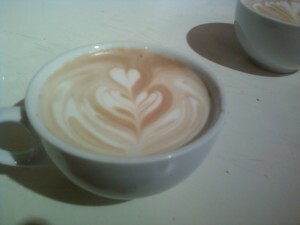 One of the baristas told me, “We want to get coffee-making down to a science. 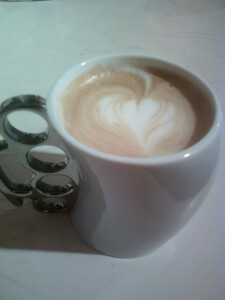 This is why all of our baristas are specially trained. Third-wave coffee shops like ours emphasize quality.” Not only do they grind the beans for each espresso drink as they are ordered, but they also do the beautiful latte art with steamed milk that one sees in pictures from upscale coffeehouses. 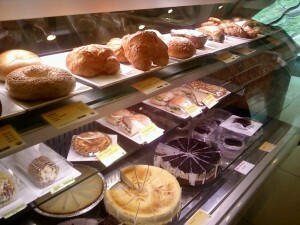 Fête Coffee also provides gourmet breakfast and lunch items, delivered daily from local businesses like Ceci Cela. Pair one of their croissants with a latte, or try one of their fresh tea creations like their Ginger Lemon Iced Tea alongside their fruity frozen yogurt. Definitely the prize item on their menu, the frozen yogurt is blended to order with real fruits of your choice and then topped with whatever crunchy additions you like. It is a must-try! Located near Baruch, SVA, and the NYU 26th St. dorm, Fête Coffee is the perfect place to spend some time alone to study or hang out with friends over lattes. In fact, the entire lounge room in the back is available to rent out to private parties and events like club meetings, and Fête will even cater a menu to your budget. So skip the pizza party this month and try gathering your club at this spacious and inviting café, where everything is fresh, delicious, and artfully made for you. Come back each week for new dessert flavors! Check out my blog RP Your Life! Get the great Student Discount I mentioned and more by clicking. Sign up for our bi-weekly newsletter for student promotions and coupons and download the coupon booklet here! The beautiful interior of Grotta Azzurra is just as wonderful as their menu. Being that my last name ends in a vowel it’s pretty much a given Italian cuisine is something I enjoy immensely. I find that when you eat food representative of your background or even if it’s the primary cuisine you eat at home, you are also critical of said cuisine. I’m always looking for an Italian restaurant that isn’t substandard and successfully fits the criteria I look for. In other words, when I eat Italian food out I want it be just as good as what I happily devour at home. Luckily I found such a place. 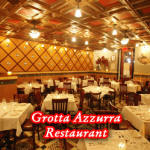 Grotta Azzurra resides in Little Italy, a neighborhood with a rich history that attracts both tourists and native New Yorkers because of the many great restaurants crowded on Mulberry Street. Grotta Azzurra has a rich history worth mentioning too. Grotta Azurra opened its doors in 1908 and was a known favorite of the late great Frank Sinatra. His music can be heard as well as other famous crooners like Dean Martin throughout the establishment. The restaurant was recently renovated and is simply beautiful. The interior is elegant due to circle pictures of famous Renaissance sculptures decorating the walls. This is all complemented by the colorful marble accented throughout, as well as the checkered floors and intricate tile designs parading around the room. The atmosphere removes you from the stress of the city and allows you to metaphorically wade in the waters of Capri— even if only for a moment. Grotta Azzurra has more than just a relaxing ambiance, but the establishment is also student savings friendly. The restaurant offers a fabulous and well-worth it lunch special from 11am-4pm during the weekdays, were for only $9.95 you can enjoy a delightful pasta dish and entrée. During my visit to Grotta Azzurra I enjoyed for my pasta dish rigatoni alla vodka and the sauce was just the perfect blend of tomato, vodka, and cream. I knew even before eating it that it’d be mouth watering good because of the just right pink coloring of the sauce. My sister opted for the penne sorrentina dish, which consisted of a tomato sauce along with mozzarella, basil, and eggplant. She mused that the dish was delicious and even more satisfying because of the tasty eggplant. When finished with our pasta dishes our entrees were served. My sister and I are both fans of chicken parmigiana, so the ultimate test for sure would be to eat just that for the entrée. We both agreed that the chicken was cooked perfectly: it cut easily and was also very light. In addition, potatoes and steamed broccoli were served with the entrée and both were equally satisfying. The added perk to this great meal clearly was the impressive price. After this enjoyable meal experince at Grotta Azzurra, I will be sure to visit again to try other pasta and entrée combinations offered as part of the lunch special. I admit, I was a little wary walking into Muscle Maker Grill. The name on its own certainly stakes out its market, and I wasn’t really sure what to expect. What I found, though, was a very friendly, casual place. 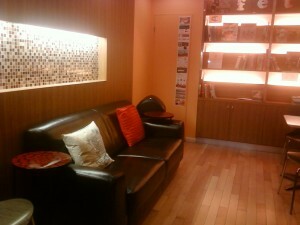 Walking in, we were immediately greeted warmly, and offered paper menus. The room is definitely casual, with a brick wall on one side reminiscent of a pizza parlor, as well as tables and booths—it’s somewhere in between a casual restaurant and a nice fast food place. As you can imagine by the name, Muscle Maker Grill prides itself on healthy food that’s good for your body, and on being a restaurant and a resource that helps people manage their health. In fact, Christopher Almazan, owner/operator of the Chelsea location, was a personal trainer for several years. He emphasized the importance of having employees that were knowledgeable about the body and health as well as friendly and welcoming. They consider themselves warmer and more hands-on than a chain restaurant (although Muscle Maker Grill is technically a franchise). What Muscle Maker Grill does well, though, is to make sure their meals are healthy without sacrificing taste. The menu offers several different options, from “Power pastas” to “Guiltless entrees,” and even low carb options and salads. I went with my mother and sister, and we ordered the Arizona, the Cajun Chicken and Penne, and the Mardi Gras Cajun Grilled Chicken Salad, respectively. 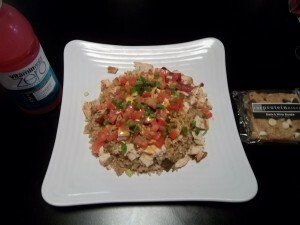 The Arizona is their most popular entrée, consisting of grilled chicken and turkey bacon over brown rice with their signature sauce. The flavors of the sauce and chicken went together remarkably well, and the sauce was even zero-carb! The Cajun chicken and penne was seasoned with a red wine and brown sauce that was also flavorful and filling; even the salad on its own was filling enough to satisfy hunger! This is no skimpy dieting salad. On top of the grilled chicken, it came with turkey bacon, tomatoes, and onions. Afterwards, we were offered dessert—which might seem contradictory to the whole health-food theme. However, the cheesecake was sugar-less, and there were protein cookies as well. We tried the protein cookies, and they didn’t taste at all like a health food substitute for dessert– they were tasty and just moist enough. The peanut butter cookie was my favorite. Muscle Maker Grill is certainly something of a niche restaurant. It’s one hundred percent focused on health (the TV in the corner was even playing exercise videos the day I went), so it’s definitely the place for any health enthusiasts. It’s also a great healthy option for college students, though, particularly those tired of instant ramen who want food that’s good for them. Everything at Muscle Maker Grill can be eaten without worrying about carb intake, and the menu even has nutrition information for each of the dishes. 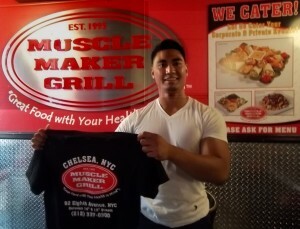 Muscle Maker Grill even offers takeout, making it a great option anytime! Click here to download the new Campus Clipper iTunes App! Follow us on Twitter, or keep current by liking us on Facebook! Want more great student deals? Sign up for our bi-weekly newsletter to get the latest in student promotions. For savings on the go, download our printable coupon e-book! 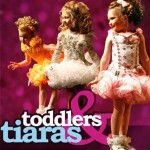 I’ve been watching the reality show Toddlers and Tiaras with what can only be described as a disturbing level of enthusiasm. There’s something about screaming 3 and 4 year olds coupled with psychotic parents that amuses me in a most-likely unhealthy way. My friends are going to intervene soon, demanding that I leave my apartment and stop the marathon watching. Things have gotten so bad they’ve already expressed concern that I will attempt to adopt a baby and move to the Deep South in order to enter her in pageants. For those who don’t know, the tots are usually entered in “glitz” pageants rather than “natural” ones. Glitz involves the use of “flippers” (false teeth), hairpieces, spray-tanning, acrylic nail tips, fake eyelashes, and bedazzled dresses costing upwards of $900. Engulfed by artificial enhancements, these girls often look more like dolls than human beings. Phrases like “total package” and “wow-factor” are tossed around by judges in a way that suggests the contenders are 21-year-old supermodels, rather than children who still use pacifiers. And all the while the frenzied parents chase their kids to try and get them on the stage: bribing them with sugar cubes, energy drinks, coffee, and chocolate. They justify their actions by saying the competition builds confidence and fosters a healthy perception about body image and self-esteem. This is said prior to the crowning ceremony where children who place runner-up have meltdowns and crying fits. Too often, the parents will say “Oh, my daughter loves (insert activity)!” Only to have the camera cut to a child freaking out about that very activity, crying or running away. Epic tantrums are provoked by uncomfortable situations and the loss of nap-time. So if I want to truly analyze my love for this show, I would say the entertainment comes from the blatant paradoxes that exist. The paradox of children being dressed up like adults, the paradox of the reality versus what the parents say is reality. Oppositions entertain me, and Toddlers and Tiaras are rife with them. Now if you’re reading this, you probably aren’t a pageant tot. 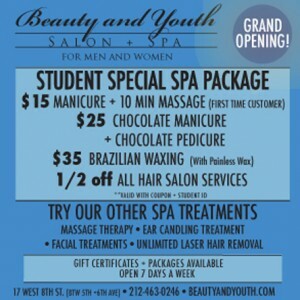 But you can still feel like a pampered princess or prince at Beauty and Youth Spa without sacrificing student savings. You can indulge in their chocolate facial just like little Mackenzie did. Though hopefully, unlike Miss Mackenzie, you’ll keep most of it on your face instead of licking it off.